May 20, 2014 May 20, 2014 - 3 Comments. Many people on the West Coast were fuming after Big U was not only turned away at the door of LA’s Finest, but he was manhandled. Game immediately stepped up and became very vocal online. There were a few instances that have took place with rappers on the West Coast and the clubs in Los Angeles. From the jump, Game became very vocal online about rappers and athletes receiving tough treatment at the doors of clubs. But, Game has since had conversations with the owner of LA’s Finest. A lot took place with Game and his comments online proved it, but a necessary conversation was had. 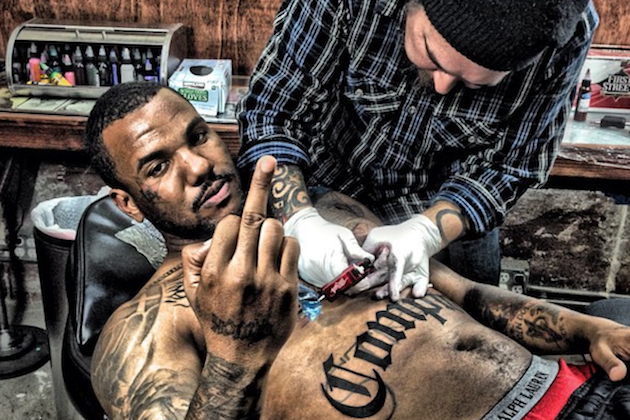 When he took to Twitter, Game revealed he made peace with LA’s Finest’s owner and he said the blame is on the LAPD. The blame is on the Hollywood division of the LAPD according to Game. With the ongoing situation now being acknowledged, now progress can begin. Sounds like a decent club, nobody probably died n that club that night. The Hollywood Division of the L.A.P.D. are a fine group of men and women doing a GREAT job in protecting the citizens of Los Angeles from street Criminals. This big tough looking street thug got a little man handled. What a big CRYBABY. These kind of guys only PRETEND to be tough. The ongoing situation is Blacks killing other Blacks. That is the ongoing situation which is an epidemic that nobody seems to care about addressing. Very sad situation.